Gail Ruffu was a rookie trainer known for her unconventional methods and ability to handle dangerous horses. When she became part owner of an untamed thoroughbred named Urgent Envoy, everything changed. After Urgent Envoy showed real promise, her co-owners forced Gail to speed up training and race him too early, causing the horse to develop a hairline shin fracture. Refusing to drug the horse to keep it running, Gail lost Urgent Envoy to her partners, who pushed the horse even harder. One more race would kill him. When nobody heeded her warnings, Gail had to act. So on Christmas Eve, she rescued her own horse. A modern-day outlaw, Gail evaded private investigators and refused to give the horse up. Blacklisted by the racing world, she learned the law at night to take on a powerful L.A. attorney determined to crush her in court. As she stood up for the humane treatment of racehorses, she also faced down the system that caused their demise. 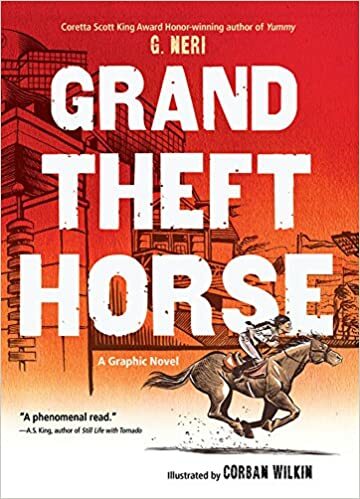 In this gorgeous graphic biography, G. Neri, author of the acclaimed Yummy and Ghetto Cowboy, retells the life of his cousin Gail, a pioneer who challenged the horse racing world for the sake of one extraordinary horse. With illustrations by brilliant newcomer Corban Wilkin, it is a must-read for horse lovers everywhere.